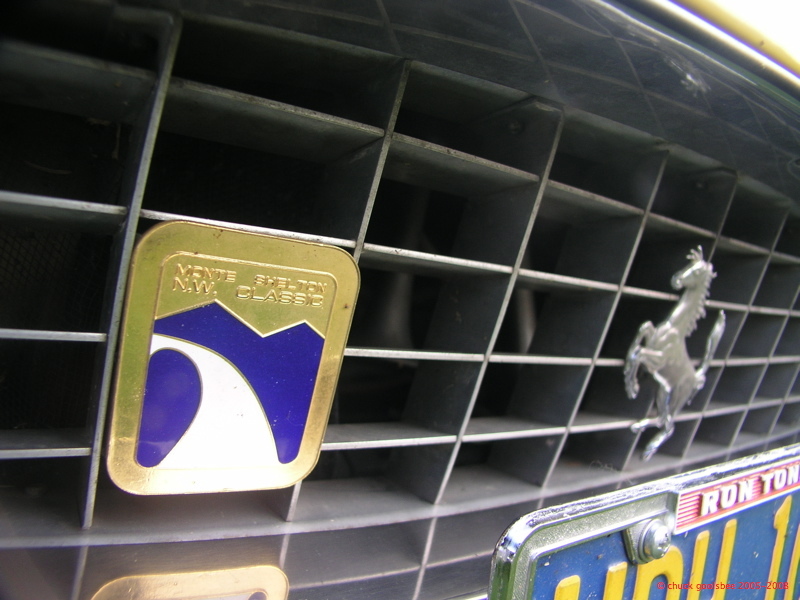 Proudly worn on the nose of this product of Maranello is a prancing pony and a Gold Medal from the Monte Shelton NW Classic rally. To be honest the Gold Medal has the greater value of the two! The Monte Shelton attracts 60-80 cars to somewhere in Oregon every August, where they vie against probability, reliability, time, speed, distance, and a genuinely evil rally master to somehow manage as few penalties as possible. My father and I two years ago managed to squeak into the “silver medal” standing (top 20 cars), and finally attained our own Gold (top 10) last summer. I really don’t have anywhere on the E-type (luggage rack maybe?) to proudly display my prize, so it sits in my office. I attribute our consistent good showing at the Monte Shelton on our annual “warm up” earlier in the summer at the “Annie & Steve Norman – College Planning Network Classic Motorcar Rally” put on by Doug Breithaupt. I plan on writing more about this event later, as it is genuinely under-appreciated. It is a small, very friendly, yet technically demanding TSD rally. The best part about it is the social atmosphere. Really great people and Doug always arranges some very unique “rest stops” and special guests along the way, such as visits to car collections. For example: The very first rally I attended with Doug we stopped at the collection of Pebble Beach Concours organizer Glenn Mounger. He had some amazing pre-war classics from Packard, Duesenberg, etc. This year’s rally will be on Vancouver Island, home to probably the densest concentration of vintage British steel on the planet. It should be an excellent event. I doubt Ron Tonkin Gran Turismo ever sold a Ford Mustang! Next Next post: Car Photo of the Day: Make-up test.